Just use alt+t while editing a file to see your projects board. You live in the code, your tasks should too! For decades developers have used TODO style code comments to track issues that almost never end up in issue tracking software. imdone is a plugin for your favorite text editor that turns code comments into trackable issues that you can update from your code. 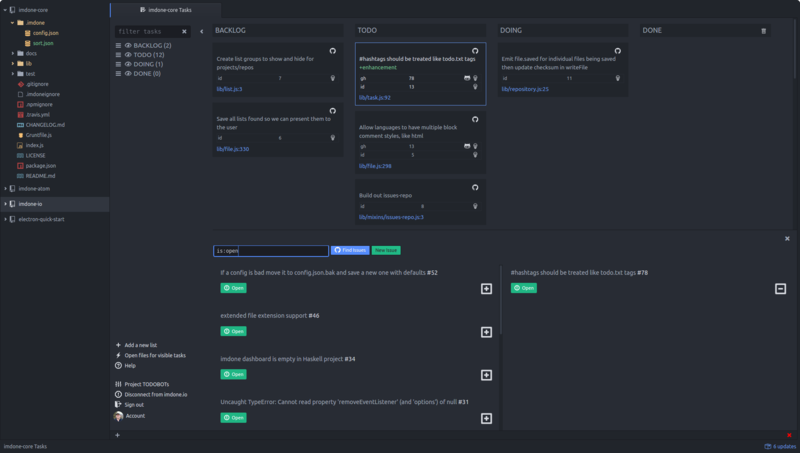 It collects all TODO style comments in your project and organizes them in a drag and drop task-board that can integrate with GitHub, waffle.io and soon whatever you want with webhooks using imdone.io. imdone works best with todo.txt and markdown syntax. See the syntax guide at imdone-core for details. ### Filtering your board imdone uses regular expression matching to filter your cards on your board. The content and the path of the file are searched, but the Token (e.g. TODO) is not searched. Just click on the trash can icon and all the visible tasks will be deleted. imdone will also get rid of any blank lines left behind! Great for cleaning up! Click on the lightning bolt icon and open all files for the visible tasks. imdone uses a bit of Todo.txt format (except priority), so +bug would be a tag. Tags in TODO content are turned into filter links, so clicking on it will filter the board. You can use Todo.txt contexts in the same way. They’ll also be turned into filter links. Another great benefit of using Todo.txt format is the metadata. Just use the format ` key:value , and your metadata will be listed in a table inside the task card. We use metadata for imdone.io integrations like gh:1 to represent github issue number 1 and id:1` to represent imdone task id 1. My favorite feature of imdone are the integrations. Today you can integrate with github and waffle.io. Jira SaaS integration is coming soon. Close a TODO’s attached issue(s) when it’s token changes to something you configure, like DONE. would close github issue number 1. Move a TODO’s attached issues to a waffle.io list you configure when the TODO’s token is changed to a token you configure. Use your code journal for anything, even planning your next set of features! ### Open files in intellij and webstorm - Open task links in intellij family of products with imdone-atom and imdone intellij plugin! .imdoneignore is implemented using the ignore package. Each file in your projects path is tested against the rules in .imdoneignore. imdone will also ignore files and folders that match a regex in the .imdone/config.json, exclude array. The array is seeded with some common excludes on first run. IMPORTANT: If your project is large (#files > 1000) consider adding an .imdoneignore file.